Performance Length: 2 x 1 hour sets of songs & line dancing or square dancing in a three hour period. 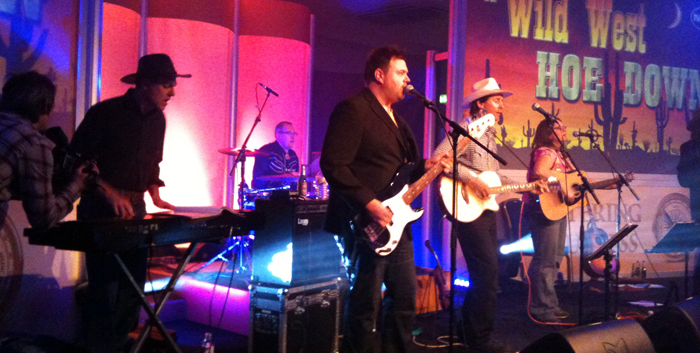 Dressed in cowboy costume and performing a wide selection of well-known Country and Western classic songs, five piece band Montana Rain is the perfect choice for an American themed event. 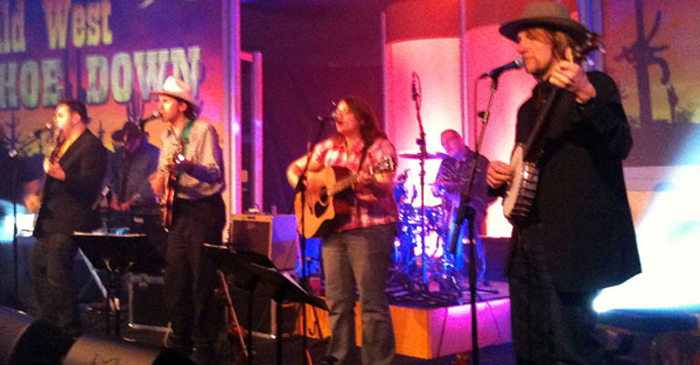 The band comes complete with a dance caller and can include line-dancing, barn dancing or square dancing.
" Pull on your cowboy boots! Get ready for a Wild West Hoedown"
Featuring both male and female vocals complete with harmonies and including fiddle and banjo, along with guitar, bass and drums, Montana Rain creates a great Country sound with an Indie feel. When the band strikes up, you’re right back there, down in Nashville! No Cowboy themed event is complete without line dancing or square dancing. Don’t worry if you’ve never danced before. 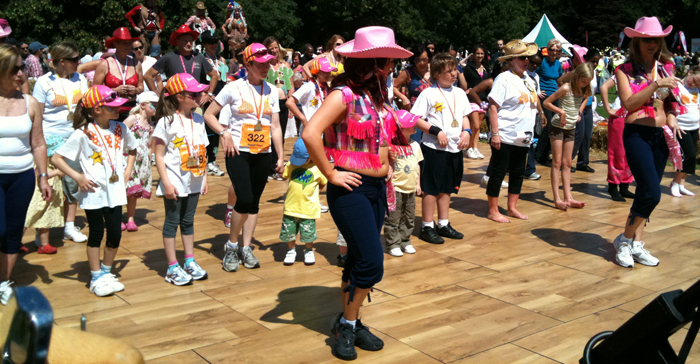 Dance caller Mannie will walk you through simple dances, explaining the steps. Everyone will be on the dance floor in no time. What can we even say? How fabulous was last night! You guys were amazing and we had such a great time. We’ve had fabulous feedback and everyone wants to know when we are having another Hoedown (for which we will of course book you guys again). You were all fabulous. Such talented musicians and a real sense of good fun! Thank you so much for playing our requests and also to the caller who made the dances brilliant – we all had so much fun! I hope that you enjoyed it and that you found us a good crowd. We will, I’m sure, be in touch again. Thank you to you all. What a wonderful evening! I’m sorry not to have written before now, but this is my first opportunity for saying a big thank you to you and the band for an excellent evening’s entertainment last Saturday. Everyone, who has passed comment to me, said what a vast improvement Montana Rain was compared with our previous band, and from your results of getting people up and moving, I can only endorse that commendation! I look forward to contacting you early to book you for next year’s Square Dance. We all had a great evening thanks to you guys. We have had a lot of feedback on how much fun the whole evening was. It’s my 40th in five years. Best wishes to you all!